Cherry Creek, in the Alberni Valley, is without question one of the quaintest, most laid back places on all of Vancouver Island. It’s the kind of place where you are likely to see tractor puttering down the road on an early fall morning, or riders on horseback any time of year. The kind of place where you might wake up to the sound of a rooster crowing and go to sleep to the sound of crickets chirping. In a lot of way, Cherry Creek is Vancouver Island. Cherry Creek is without question Port Alberni’s most sought after rural neighbourhoods. Small acreages are the norm in Cherry Creek and most have beautiful views of pasture land or surrounding mountains. At the centre of this semi-rural lifestyle is Cherry Creek Hall, which is right across the street from the Cherry Creek Volunteer Fire Department. Other notable gathering spots are the Emerald Coast Vineyards and Wine Shop and the famed Coombs Country Candy. 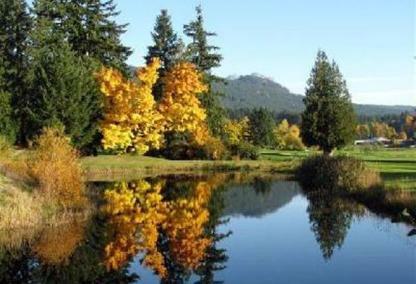 Cherry Creek is also home to the Alberni Golf Club – the Alberni Valley’s premiere golf course. This traditional, par 70, golf course was founded in 1920. Nestled among the evergreens, with Mount Arrosmith watching over it, the Alberni Golf Club attracts golfers from around the world. Now that we’ve painted a picture of this Vancouver Island paradise, you should know that Cherry Creek has a…wilder side. Two of Vancouver Island’s most stunning hiking trails are located in Cherry Creek. The 22km long historic Log Train Trail and the iconic Hole in the Wall. These trails are the starting points for trails and off roads which span some of Vancouver Island mountain ranges. You’ll find people enjoying ATVs and motorbikes on these trails. Which leads us to one of Cherry’s Creeks other gathering spots, the Alberni Motocross Track, where the peace a quiet will be shattered by the sound of two stoke engines and people having a great time. Cherry Creek in the Alberni Valley is a place for families and for retirees. It is a place where the pace of life is a little slower, and the sun seems to shine a little more often. To the lucky few who live here, Cherry Creek is a piece of paradise.